Today Amazon Dash Buttons, which provide a simple one-press replenishment order for household consumables at the point of use, have become available to Amazon UK (Prime) customers. Amazon customers in Austria and Germany can also get Amazon Dash buttons from today. Amazon Dash buttons launched in the US back in 2015. Initial takeup was reportedly slow but now US customers have started to really warm to the service and asked for and received more buttons, covering a range of over 150 products. 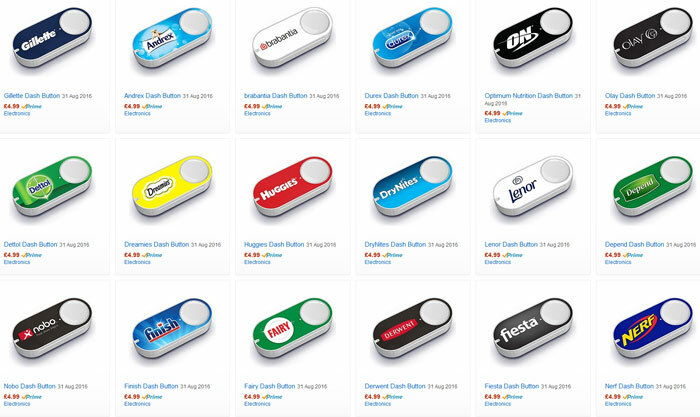 In the last two months alone "Dash Button orders have increased by 3x," says Amazon. You order Dash button(s) from Amazon for household products that you regularly buy. Common examples might be an Ariel button on your washing machine, an Andrex button next to the throne, and so on. A Dash button is a Wi-Fi connected device so will need an initial setup to be done. You can stick the device to a place on or near the point of use using a hook or supplied reusable adhesive pad. When you are running low on something you press the appropriate button. The Whiskas button next to the cat feeding area, for example. That sends your order to Amazon for next day delivery – as this is a Prime only service. Don't worry about your young children just pressing the buttons for fun – you can enable a notification that you've ordered (so you can cancel) and multiple presses in the 24 hours after an order will be ignored. Amazon says your Dash Button order will come next day and that you will get "the same low prices available on Amazon.co.uk". An important point to note is that each Amazon Dash Button costs £4.99 but that money can be used as credit against orders submitted from the Dash Buttons in your house. 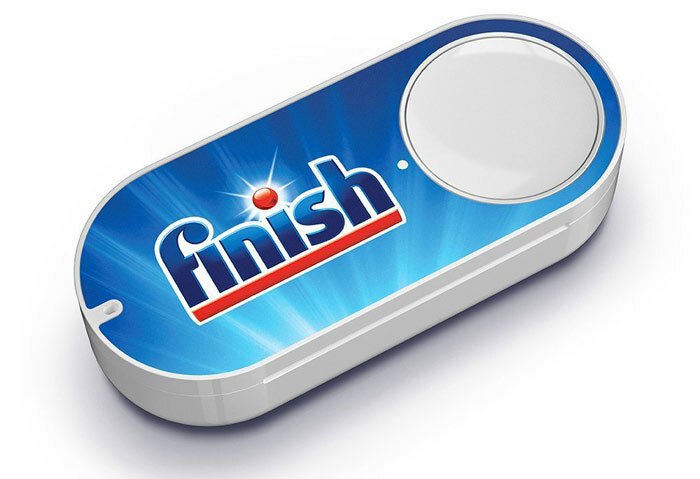 Brands covered by the Amazon Dash Button ordering system in the UK right now include; Air Wick, Andrex, Ariel, Brabantia, Fairy, Finish, Gillette, Huggies, Johnson's Baby, Kleenex, Listerine, Nescafe Dolce Gusto, Neutrogena, Nicorette, Olay, Pedigree, Philips Sonicare, Rimmel, Vanish, Whiskas, Wilkinson, and more. In a simultaneous announcement Amazon is making the Amazon Dash Replenishment Service (DRS) available in the UK. 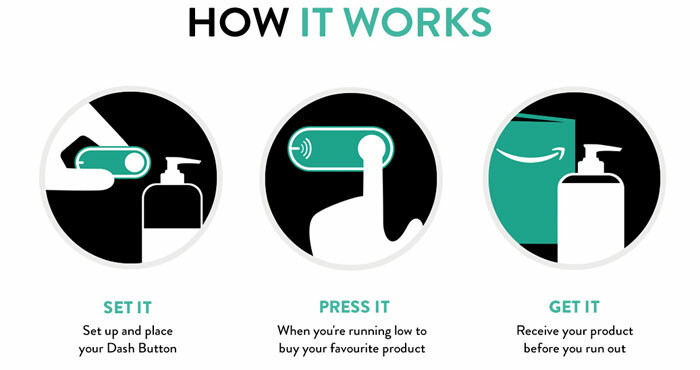 This service allows smart appliances to make consumable orders – like having a built-in automatic Dash Button. Partner manufacturers integrating such functionality include the likes of Bosch, Siemens, Samsung, Grundig and Whirtlpool. Nice idea, although I'd rather it just updated a notepad document on my NAS for me to take shopping at Sainsburys. I'll stick to my mobile phone. On a serious note, seem like a fairly good idea (my first thought was exploitable gimmick, but the pricing model is right and looks like you can't be bankrupted by click-happy kids). A customiseable version would be good (configure it with the product ID and print your own label). Ideal for recordable media or printer ink.